When 15,000 vibrant and politically engaged people gather in one spot for five days and organize themselves into more than 1000 workshops, dozens of major plenaries and late night parties across five major cultural hot spots, no one article can claim to give a full account and get away with it. But an event on that scale livened up Detroit, Michigan during the week of June 22-26 at the US Social Forum, when Cobo Hall and several nearby universities were buzzing with thousands of people trying to shape a new world. I won?t even try to capture it all. I?ll just affirm the common conviction that it was a major happening on the left and a huge success, an inspiration and an affirmation of hope that progress is being made towards a better future. Then I?ll humbly offer my take on it. We?ll start with some highlights and, for those who aren?t familiar with the Social Forum movement, offer a few explanations. The Forum started on June 22 with a massive march of thousands through the streets of a devastated and de-industrialized Detroit. ?I?ve never seen anything like this, in Detroit or anywhere,? said Forum participant and Detroit resident Charnika Jett. ?The sense of joy, support, and determination on the part of the people here, both Detroiters and visitors, is just incredible.? ?What an amazing day!? said Allison Flether Acosta of Jobs with Justice. ?We held an orientation session for local coalition folks early in the day, then joined the march with the other members of the Inter-Alliance Dialogue and more than 10,000 people for a lively march through downtown! We ended at Cobo Hall, and then convened for the opening ceremonies.? One important new addition to the young crowd in the streets was the participation of organized labor. According to the AFL-CIO News Blog, ?Newly elected UAW President Bob King joined Metropolitan Detroit AFL-CIO President Saundra Williams; Al Garrett, president of AFSCME District Council 25; and Armando Robles, UE Local 1110 president, in leading a march and rally through the streets of Detroit. Chanting ?Full and Fair Employment Now!? and ?Money for Jobs, Not for Banks!? Participants demanded Congress address the pressing jobs emergency.? 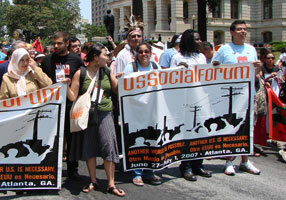 The USSF 2010 in Detroit is an outgrowth of the World Social Forum. The WSF started some 10 years ago as a counterpoint to the World Economic Forum, the elite gathering of global capitalists in Davos, Switzerland. The first WSF was held in Porto Allegre, Brazil, with backing from the Brazilian Workers Party. It soon became co-sponsored by a wide and inclusive variety of grassroots organizations working for global social justice. Since then, the site has shifted around the world?s larger cities, usually in the Global South--Mumbai, Nairobi, Caracas, and mostly recently, Belem in Brazil. The next WSF will be in Dakar, Senegal in 2011. In certain years, however, the World Social Forum movement is decentralized, and various countries and regions organize their own. The first nationwide and major one to be held in the U.S. was in 2007 in Atlanta, GA, which drew some 12,000 participants. Detroit was chosen for 2010, largely to serve as a U.S. urban example of how the injustices of corporate globalization have a powerful impact even in the homeland of Empire. Despite the air-conditioned conveniences of Cobo Hall and the modernized blocks in the inner city?s center along the riverfront, just walking about 10 blocks in any other direction and you would find yourself in a shocking urban wasteland of closed factories, shuttered stores and abandoned housing. By any measure, this year?s USSF was a big success. It drew over 15,000 largely young and ethnically diverse student and working class participants. They participated in a total of 1062 workshops and panels, 50 major assemblies, and conducted a huge march of thousands through the streets of Detroit?all in a festive and cooperative atmosphere. To the Left: building a movement for social justice: intersections and alliances across race, class, gender, sexuality, age, ability? The tracks helped focus participants in two ways. For those wanting to work downward with others on a given workshop on a narrower topic, they helped establish connections. For those wanting to pull forces together for the larger ?People?s Movement Assemblies,? they also helped to gather resources to a central focus. In brief, the framework either contained or allowed something for everyone, including the space to self-organize pretty much whatever one had in mind. You weren?t necessarily guaranteed a large audience; promoting your own special interests was largely up to you and your friends and allies. Since three years earlier, some 12,000 activists and their various organizations had taken part in Atlanta?s USSF 2007, many participants this time around had a ?head start? of core experience to build on for Detroit. 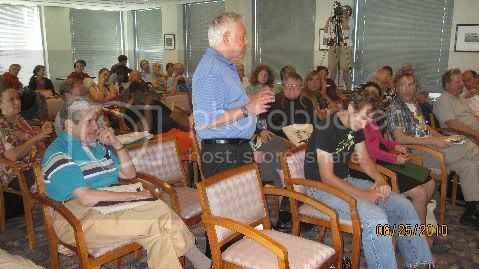 Atlanta?s core organizers even published a book on the topic, ?The United States Social Forum: Perspectives of a Movement.? Newcomers would have to pick up organizing techniques on the fly. Many organizations started their preparations about six months ago. For a few, this meant having people join the nationwide organizing core for the whole event, or at least getting in touch with it. But for most, it meant figuring out what their two main workshops would be (that was the maximum allowed for any one group), and who they could ally with to form more workshops around their preferred ideas, projects or perspectives. It also required registering ahead of time, making a small donation, planning displays, and then, via the web sites, staying in touch with what others were posting, so as to promote cooperation and avoid duplication or conflict. In brief, the planning structure encouraged networking horizontally, and from below. The result was an amazing array of workshops, on every topic under the sun, ranging from ?how-to? hands-on organizing techniques to oral history and theoretical debates. ?There was a workshop for every cause and strategy,? said a Labor Notes reporter, ?from stopping natural gas ?fracking? to using puppetry to move your campaign.? Perhaps the most significant new development for the 2010 USSF was the active participation of the AFL-CIO and other labor organizations. Labor?s participation gave the USSF important financial support and populated the event with a cohort of labor activists from around the nation. The AFL-CIO presented two workshops in Cobo Hall on Thursday morning that were well attended. The two hour workshop on the Fight for Jobs and Economic Recovery was led by an AFL-CIO staff person and the national jobs coordinator of Jobs with Justice. The workshop focused on the tasks of organizing the unemployed locally and mobilizing for the October 2nd National March on Washington for Jobs and Justice. The second focus of the workshop was around how to raise the militancy of tactics in the struggle for jobs. The workshop of 80 people broke into 8 subgroups to separately come up with proposals for local organizing and raising the level of militancy, then reported back to the body. 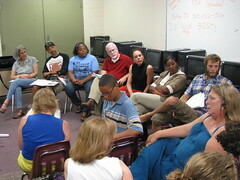 The Immigration rights workshop was also organized by the national AFL-CIO. Panelists included a founder of the Alliance of Guest Workers founded in 2007, who responded to the abuse of immigrant guest workers who are recruited by corporations on the basis of false promises. ?Guest workers are treated as slaves,? explained Pat Fry, ?forced to work for little pay in dangerous work conditions under threat of being reported to ICE if they quit their jobs.. The point made by the panelists who were both either guest workers or undocumented was that legal status does not end abuse of immigrant workers. ?I was impressed with the panel and the role of the AFL-CIO in organizing it,? Fry added, ?and the work that the labor federation is doing working with the U.S. Labor Department to expand U Visas for workers who quit their jobs due to abusive employers. We are working legislatively with Congress to support the POWER act introduced by Sen. Menendez (NJ) and its work with the building trades unions who are requiring employers who recruit guest workers to cover them under the same terms of work ? pay and working conditions ? as union members.? The Committees of Correspondence for Democracy and Socialism, for its part, decided early on to try to organize two panels, one on 21st Century Socialism, which it hoped to do as a ?left unity? efforts with other socialist groups, and a panel on the role of the struggle for democracy in the South as a critical element to winning nationwide democratic gains. But since we wanted to do more, we also cooperated with other groups in putting together panels on the peace movement and the economy, on Vietnam and Agent Orange, on Anne Braden?s Legacy as a Southern Activist, and especially on the Democracy Charter initiative launched by civil rights veteran Jack O?Dell. We also worked with groups like Kentuckians for the Commonwealth for a workshop on organizing in Appalachia and supported the Iraq Vets Against the War on GI organizing. Altogether, to promote these efforts, we put together our own program, a ?CCDS Track? of some 32 panels and two ?Peoples Movement Assemblies.? Duncan McFarland, a CCDS National Committee member, worked with the Vietnam Agent Orange Relief and Responsibility Committee and Veterans for Peace to conduct a powerful and moving workshop on Vietnam the first full day, June 23. He presented slides from a recent tour of Vietnam showing the ongoing human damage of Agent Orange within the broader context of Vietnam?s progress since the war. ?We were also able to promote the upcoming CCDS 2011 socialist study tour to Vietnam,? said McFarland. The Democracy Charter workshop was held in the Westin Cadillac Hotel on Friday, June 5. It was chaired by Pat Fry, a CCDS Co-chair, and led by a well-organized panel. Bill Fletcher, Jr., author of ?Solidarity Divided: The Crisis in Organized Labor and a New Path toward Social Justice,? called for the organizing of People?s Assemblies where the Democracy Charter can be a tool for engaging grass roots discussion on what we stand for. ?It is less a document,? said Fletcher, ?and more a process.? He cautioned, however, that the ANC Freedom Charter would not have been the organizing tool that it was without the South African Communist Party, and it is hard to think about the utility of the Democracy Charter apart from a more organized left in the U.S.
Tim Johnson, a librarian at New York University and a left journalist, said the Democracy Charter needs a ?conscious movement? that can organize around it. Johnson also spoke about the ideological confusion sown by corporate control of the airwaves. Frances Fox Piven, the author of many books on poverty issues, said there are many charters and that another should evolve out of the mass movement, not before the movement. Instead, she said, what is needed is a new manifesto that explains the capitalist system. Others commented on the specific points of the Charter in ways to deepen the content. Jackie Cabasso of the Western States Legal Foundation talked about peace and disarmament ? no country?s population has ever voted to have nuclear weapons, she said. CCDS?s Carl Davidson said the Democracy Charter filled the need for a principled agenda as an organizational tool and an answer to Glenn Beck?s ?9-12 principles? for the Tea Party. ?It reminds me of the old ten-point program of the Black Panthers,? he said, ?but aimed at the entire population.? Discussion that followed struggled with the various themes on process and organizing that were expressed in the presentations. Most important, the workshop helped launch the newly formed Democracy Charter Grassroots Organizing Committee. The DSA-CCDS sponsored joint workshop on socialism that followed was a big success. The speakers included David Schweickart, author of ?After Capitalism;? Carl Davidson, national co-chair of CCDS; Libero della Piana of the Communist Party, USA; Eric See of Freedom Road Socialist Organization; and Joe Schwartz, vice-chair of DSA, with David Green of DSA as the moderator. Held in the UAW?s Ford Building, it was standing room only until the room dividers were opened to deal with the overflow. David Schweickart opened with a PowerPoint presentation making the case for ?Economic Democracy? as a successor system to today?s capitalism. ?If we can elect our mayors, why not elect the managers of firms we own or control?? he asked. Within a Marxist framework, he segmented markets into three?labor, capital and goods and services?and argued that the first two could be restricted or abolished, while the third would best be maintained, although regulated. This would allow for a worker-controlled variant of a socialist market economy that would give us a basis for a genuine democracy rather than our current ?dollarocracy.? Carl Davidson elaborated on important political points about democracy, both as an end and a path to it socialism. He went on to describe 20th Century socialism as compromised by Stalinism and its distortions, the excesses of the Cultural Revolution in China, and the genocidal results of Pol Pot?s Kampuchea. A 21st century socialism would do best to recognize that all governmental power, of whatever sort, is limited by natural human rights that are inherent, even if they develop historically. Davidson?s second point focused on ?our dual tasks, democratic and socialist, which overlap but are not the same.? The first involved finding the forms to unite a progressive majority, while the latter involved uniting a militant minority around serious policy work and revolutionary education. Libero della Piana opened by describing how left unity was something that was achieved ?after we?ve worked together in a practical way. It?s more of an outcome of struggle than a starting point.? Speaking to the problems of past socialisms, he told how one friend told him that the CPUSA had ?the best brand? on the left. ?Yes,? he replied, ?but what about the content? Are we an Edsel? The point is we have a lot of baggage, good and bad.? He noted, however, that whatever the problems of the left, ?this system has no good answers, and ?even with the right?s attacks on Obama as a ?socialist,? new interest is being aroused, especially among young people, and we had best relate to it.? Eric See of FRSO started by taking a quick poll of the audience: Were they socialists and what did it mean to them, in a nutshell? He got dozens of quick responses, from ?eco-socialism? and ?ending racism?, to ?bringing democracy into the economy? and ?the workers in power.? The brutality of the system, he warned, could itself bring us to Rosa Luxemburg?s choice, ?socialism or barbarism.? After posing a series of poignant questions, he noted that, first, efforts to ?refound our thinking? was in order, and second, however corrupt our electoral system, we had to find ways to work through it ?in order to get past it.? Joe Schwartz of DSA noted the need to fan the flames and expand the mass movements. ?We have lots of local activity on many fronts, but still not enough. Workers, for instance, are not spontaneously demanding unionization in any massive way.? Next he stressed the fight against racism and the apartheid-like divisions created in both affluent suburbs and across the board in the public sphere. ?Who can deny the overt and open use of racism to build a center-right majority for the next election?? He concluded with a call for a ?Second Bill of Rights,? one that expanded democracy into the economic and social spheres, beyond individuality. The discussion that followed covered a range of issues. People went deep into the matter of ecology and climate change, into how socialist experiments could be launched and survive with the context of capitalism, and into the importance of engaging youth in social movements and anarchist networks. When we had to leave the room, DSA invited everyone to a tent outside offering free ice cream, an ?ice cream socialist.? These two workshops were not the largest or even necessarily the most important. ?I attended three workshops that were very large,? said Randy Shannon, a CCDS National Committee member, ?two of which were packed with youth. The composition of these workshops reflected that of the USSF overall, which is predominantly young people. One of my objectives at the USSF was to promote our new booklet on full employment, and the concepts of employment as a human right and full employment were very appealing to them.? Since any one person at the USSF could only attend nine workshops and three assemblies, a sort of ?competitive marketing? was essential if you wanted to use the immense gathering as an organizing opportunity. It enabled any group to use the USSF as a way to organize its own ?conferences within a conference? on any number of subthemes. 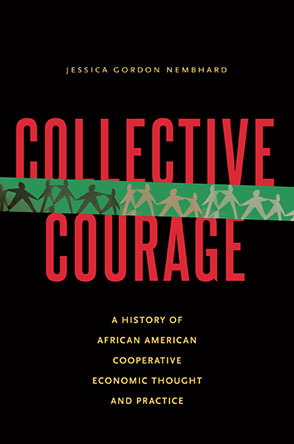 The Solidarity Economy Network organized one of the larger projects like this. SEN itself was founded out of a project of about 10 groups to organize some 70 panels at the Atlanta USSF in 2007. It had also gathered up the best of the 2007 presentations and produced a book introducing the topic. In Detroit, it expanded its effort to include some 109 workshops on solidarity economy related themes, as well as getting a speaker from the solidarity economy movement in Brazil as a speaker on one of the major closing panels. "It's important for other parts of the world to realize that there is a lot of organizing going on in the belly of the beast," said Emily Kawano, executive director of the Solidarity Economy Network. "But there has been a lot of progress made, as you can see by the growth in the number of SEN-related activities here." Kentuckians for the Commonwealth served as a good case in point on how local groups used the forum. Two dozen of their members joined with dozens of Kentucky allies, such as Jobs with Justice, and loaded buses for Detroit. Once there, they hosted two powerful workshops with about sixty people attending between them. The workshops were ?The Struggle For Justice in the Coalfields of Central Appalachia and Colombia? and ?A Discussion About the Life and Example of Anne Braden.? ?I?m an old radical,? said Jack Norris of KFTC?s Jefferson County chapter, ?and I?ve never been around this many other radical people ? including lots of young people in leadership roles. It was an opportunity to pass the torch to the next generation.? KFTC partnered with the Alliance For Appalachia in setting up a booth throughout the five days to talk to people about mountaintop removal mining and other damages inflicted on communities by the coal industry. One CCDS local chapter, Metro DC, also organized a workshop, entitled ?Rapid Solarization Can Drive Sustainable Economic Growth While Preventing Catastrophic Climate Change?. David Schwartzman, Walter Teague and Jane Zara from DC Science for the People made presentations. ?Unfortunately, we were moved twice and ended up far from the center of the conference,? said Teague, ?and so the attendance was small. But we distributed widely throughout the conference the new three-fold leaflet "Preventing Climate Catastrophic Change and a revision of the 18 page in-depth piece "Climate Change: An Unprecedented Challenge.? The major venue for groups to display their wares was the huge Macomb sector of Cobo Hall, which had hundreds of tables and displays. ?CCDS had a good, well-stocked table,? said Mark Solomon, a former co-chair. ?Our material is becoming a bit more attractive!? There were also additional street demonstrations throughout the week. ?I was thrilled to participate in a Friday morning march on Chase Manhattan Bank - of over a thousand people to demand that the bank cease loans to union busting corporations and stop throwing people out of their homes," said Pat Fry, a native Detroiter. The march was organized by the Farm Labor Organizing Committee demanding that Chase stop loans to the RJ Reynolds in North Carolina where FLOC is organizing tobacco workers and the Detroit coalition to stop home foreclosures led by UAW, community and religious leaders demanding that Chase stop throwing people out of their homes. The march succeeded in Chase agreeing to sit down and meet with leaders of both movements. Another march for jobs was organized on the second day of the USSF by Jobs with Justice, AFSCME Council 65 and the Metro Detroit AFL-CIO demanding, ?Money for JOBS, not Banks!? Another street corner rally was held outside Cobo Hall by Emergency Medical Technicians from the Detroit Fire Department who were losing their jobs due to city budget cuts, losses that will leave Detroit with 12 ambulances for the entire city. One fairly interesting feature of downtown Detroit, once you got the hang of it, was the ?People Mover,? a two-car train that covered a circular route through the downtown area. New Yorkers tended to scoff at it as a ?toy subway,? but it actually worked rather nicely getting people to decent and inexpensive restaurants, and the nearby culture and entertainment area, labeled the ?Leftist Lounge,? for late-night parties and revelry. ?The most fun I had was at the Leftist Lounge,? said Tina Shannon, a CCDSer and also president of the 4th CD Progressive Democrats of America in Beaver County, PA. ?It was a series of warehouses turned into dance clubs. The walls were covered with posters from social movements and pictures of activists and videos documenting protest in different places. The music in each room had a different flavor. The crowd was mostly young and very diverse. The social atmosphere was welcoming. Us old folks didn?t feel out of place. We just danced and let our hope and faith in our young be rejuvenated. My only regret was that CCDS only had one literature table in the main hall and not here.? As for housing, the downtown hotels were filled, as were motels as far as 25 miles out. Naturally, everyone looked up old friends still living in the Detroit area, and for the more adventuresome youth, a vacant lot about half a mile from Cobo served as ?Tent City? for tent campers. Along with one or two others, I found a legal spot to park my truck camper/RV within a ten-minute walk. "We secured 3,000 hotel rooms in downtown Detroit, except for the MGM Grand Hotel who wouldn't work with us," said Maureen Taylor, chair of the organizing committee in Detroit. "It was good to come to Detroit. We are validated. We've got love, commitment and anger."
? From the assembly discussing the Oct 2 March on DC for jobs initiated by the NAACP, La Raza and several unions: ?Support the One Nation, Working Together march to be held in Washington, DC, October 2, 2010. Jobs, Education, Housing, Immigration Rights, Cut the Military Budget!?
? From the resolution on Displacement, Migration, and Immigration: ?The freedom to move across borders that were set up to colonize and exploit people for profit is a basic element of human dignity. We recognize the right and need for Peoples to migrate and connect across the world to experience other cultures and expand our understanding of life.?
? From the Endless War and Militarism resolution: ?We call for a diametrical shift of U.S. tax revenues from war and militarization to meet human needs, here and abroad. This requires recalibrating the moral compass of the nation in ways that prioritize sustainability, justice and equity over power, growth and control of resources.? The WSF approach to resolutions and platforms has developed several criticisms over the years. Some argue that the SF structures bend too much towards anarchism, avoiding a unified spearhead against a common target. A few others argue that the Social Forums have become ?tame? and ?taken over? by foundation-funded Non-Governmental Organizations, or NGOs, meaning Greenpeace, the Sierra Club and the like, which have more liberal politics and are engaged with government in various ways. Still others have become more receptive to the recent call by Hugo Chavez of Venezuela to found a new ?Fifth International? of socialist and related anti-imperialist liberation movements, which would have a higher level of unity and discipline. But these criticisms are all a minor chord in the background. When all is said and done, there?s still nothing quite like the cross-fertilization and synergy that arises en masse from the formula devised by the Social Forum. Its efforts bring the political left and the social movement left together in one intense happening. As long as it?s not broke, it?s not likely anyone is going to be successful fixing it. 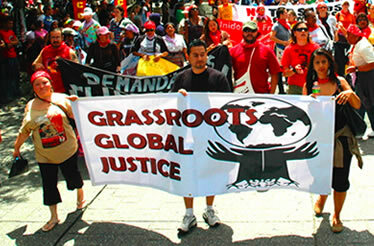 World Social Forum at a Crossroads: 5th International, Solidarity Economy, or Stand Pat?